Welcome back to Dealer's Choice, where food expert Ian Purkayastha clues us in on what top chefs across America are serving on freshly ironed white linen tablecloths at upscale restaurants. Ian's a food dealer to over 300 restaurants nationwide—including a clientele of chefs like Sean Brock and Jean-Georges Vongerichten—and his smooth sales pitch and top-shelf product list has everybody hooked on the goods he’s slinging. 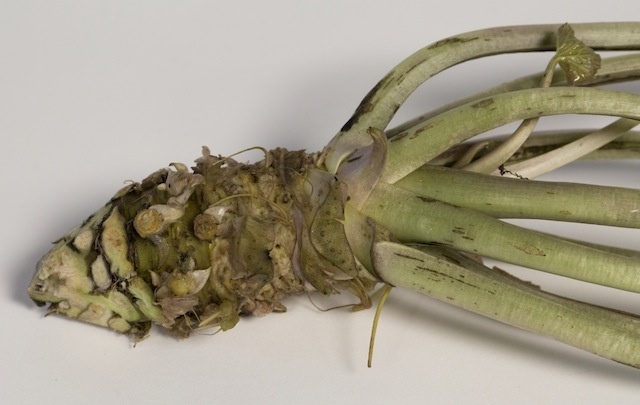 Real wasabi, a.k.a wasabia japonica, is harder to get than high-quality heroin. Almost all of what's labelled wasabi is a cheap, pre-mixed concoction of green food coloring, horseradish, and Japanese hot mustard. You can buy the fake stuff in a toothpaste tube, rolled up in a wet ball next to some red dye number-40-marinated ginger and imitation crab roll in the 7-Eleven sushi case, or in powder form at mainstream grocery stores. Authentic wasabi paste, made from freshly grated rhizome—the green stem of the plant—is pretty dope in the realm of modern medicine. It’s served with raw foods like sushi because of its antimicrobial properties. Many doctors believe that it can prevent tooth decay, so stick some in your mouth and think about your dentist. Fresh wasabi stems contain chemical compounds known as isothiocyanates, which improve liver function, treat and prevent blood clots and asthma, and even combat cancer. They're also the culprit behind those fleeting moments of burning sensation in your nasal passages that feel like someone poured a bottle of Drano up there. Fresh wasabi is difficult to cultivate because of its finicky preference for cool, shady conditions, which is also why it has a shocking price tag of around $150 per pound. It is rarely grown outside of Japan, but in 1993, a small farmer in Vancouver, British Columbia, received his first batch of wasabi seeds. Twenty years later, nine farms have blossomed, peppered throughout Canada, Oregon, and Washington State. A wasabi rhizome up close and personal. Traditionally, wasabia japonica takes 18 to 24 months to grow before it develops into a fully mature rhizome ready for culinary usage. In North America, the modernized farms that grow these green plants use a mixture of hydroponic growing conditions and high-pressured water jet streams to grow rhizomes at a rapid pace between 12 and 15 months. It’s green. Just look at it. Legit wasabi is an entirely different vibe from those pre-mixed green balls of heat whippets that everyone is accustomed to consuming. Freshly grated rhizome is fiery hot with a floral finish that will clear out any sinus infection. It smells spicy and green, like chlorophyll. If you don’t know what chlorophyll smells like, phone a biology teacher or sit inside a greenhouse and take a big whiff. Baller chef Masaharu Morimoto —Japanese kaiseki and sushi whisperer—stores rhizomes in fresh ice water that’s changed on a daily basis. This tactic allows for the wasabi to last up to three weeks. When you’re ready to make that magic moment happen, rinse the rhizome under cold running water and scrape off any bumps or rough areas along the sides with a stiff brush. Cut it just below the leaf base and inspect the exposed flesh to make sure that it is uniform green in color. Grate the rhizome with a Microplane or a traditional wasabi grater for a smooth, even paste. It oxidizes quickly, so make it just before serving for the best results. This stuff is harder to source than most of the esoteric food products on the US market, and I’m in the business. While I can’t divulge my sources, I would recommend exploring Japanese grocery stores to see if they are selling fresh rhizomes. The next time you find yourself at a Japanese restaurant or sushi spot where they’re not freshly grating the wasabi directly in front of you, I can almost guarantee that you are eating fake green glop straight from the jar. If that happens, stand up, knock your table over, and scream, “Imposters!” If you know that it’s fake but don't care, I get it. Sometimes, we all just want to eat paste without judgement. How Are Fungi Different from Plants? wasabi mac: now that's what i call using your noodle.